Proved 19 January 1884. Will Book E, Page 331, Register of Deeds Office, Cumberland County, Fayetteville. On 12 December 1884, David Burnett’s executor, Daniel C. Monroe, filed a petition to sell lands for assets. Neill R. Blue, Alexander McKethan, John A. Monroe, Jane Burnett (widow), Mary Manuel, Catharine Burnett, Elizabeth Ann Chavers, Sarah Eliza Oxendine, Laura Columbia Williams, Amanda Carolina Burnett and Lundy Jane Burnett, minors, and John Burnett were named as defendants. 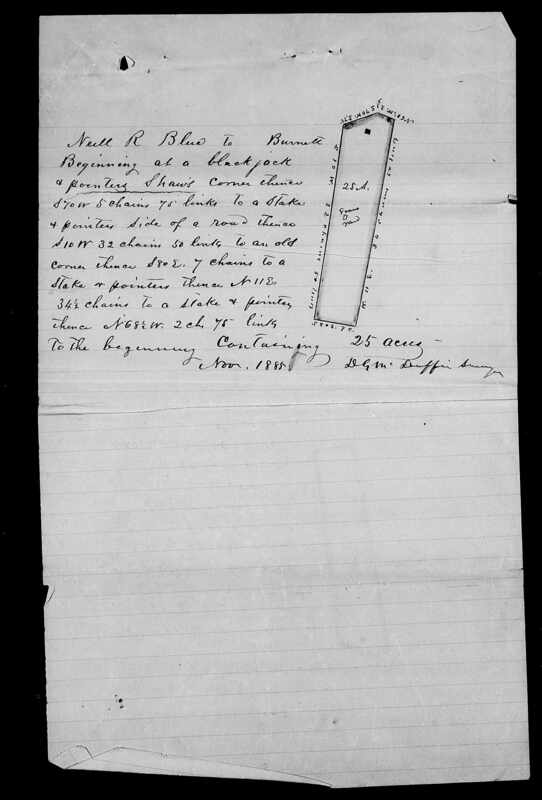 Monroe noted that Burnett’s debts were about $250; that his personal estate had no value and was insufficient to set off a one-year widow’s allowance; that Burnett’s real property consisted of two tracts received from his father Jesse Burnett, totaling 150 acres, and located on Middle Creek between Buies Creek and Little Rockfish and between Little Rockfish and Middle Creek in 71st township; that Burnett’s widow Jane remained in his dwelling house on said tracts; that there were various claims on parts of the tracts; and that all the defendants lived in Cumberland County. Other documents listed Burnett’s widow as “Jennette” Burnett and identified his daughter’s husbands as Jacob Manuel, William Chavers and Alexander Oxendine. Executors released and quitclaimed the 25 acres above to the widow and heirs. It contained a house and a graveyard. From the file of David Burnett, Cumberland County, North Carolina Estate Files 1663-1979, https://familysearch.org. Original, North Carolina State Archives. In the 1860 census of Western Division, Cumberland County: David Burnett, 42, farmer, wife Jane, and children Mary, 12, Elizabeth, 10, Sarah, 9, John, 4, and Laura, 4 months. Next door: Jesse Burnett, 70, and wife Elizabeth Burnett,72.